Keeps your signal consistent and under control without messing with your tone. Smooth, studio-style compression tones. Plenty of output available. 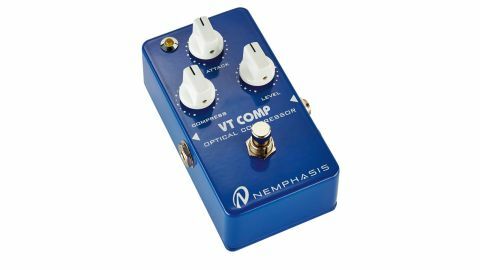 Designed for studio-style compression, the VT Comp from Italian company Nemphasis uses optical circuitry to achieve its aims, which it delivers through knobs for adjustment of the attack as well as the amount of compression and output level. "The compression is smooth and transparent - but you'd miss it if you turn the pedal off." The attack knob offers slower attack times as you advance it. To the left, it clamps down quickly on your signal putting a real snap and pop on the front edge of a note. Further round, that becomes less pronounced: the compression is still there but its onset is not as obvious. Overall, the compression is smooth and transparent - you might not notice it in action but you'd miss it if you turn the pedal off. A bonus is that there's plenty of output level available, and with compression right down and level up, you can use the pedal as a very natural clean booster. With higher amounts of both knobs together, it's a great amp driver.